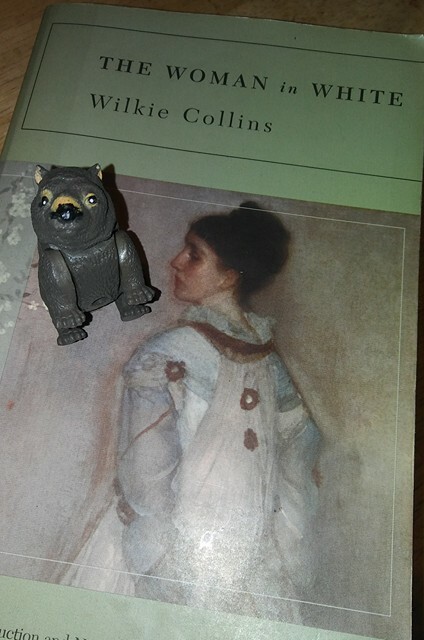 Inspired by artist Dante Gabriel Rossetti’s passion for wombats, every Friday is Wombat Friday at Pre-Raphaelite Sisterhood. 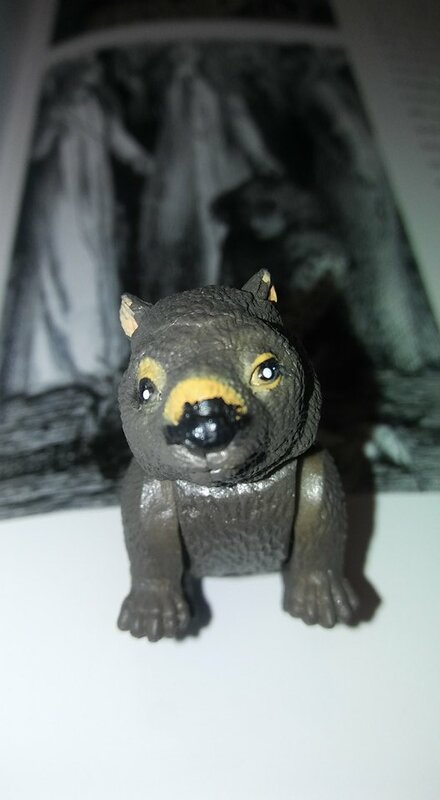 “The Wombat is a Joy, a Triumph, a Delight, a Madness!” – Dante Gabriel Rossetti. You all know T-Dub is a worthy assistant here in my Pre-Raphaelite hood (Get it? Sisterhood? Hood? Okay, I’ll move on.) I recently wrote about Rebecca Solomon’s painting The Wounded Dove and the meaning and symbolism of doves has been on my mind lately. 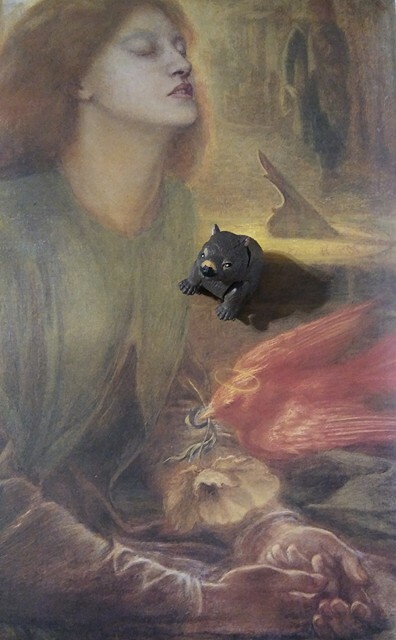 This gives me the perfect opportunity to teach my faithful wombat about Dante Gabriel Rossetti’s “dove,” Elizabeth Siddal. 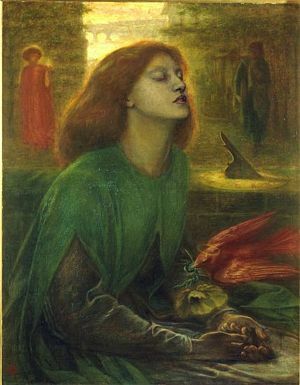 “Dove” was one of Rossetti’s pet names for Lizzie, who became a model for several Pre-Raphaelite artists when she was discovered by Walter Deverell in 1849. She famously (and dangerously) posed as Ophelia in the 1854 painting by Sir John Everett Millais. Rossetti encouraged her development in art and the pair eventually married in 1860. Elizabeth Siddal in Rossetti’s painting ‘‘The Damsel of the Sanct Grael'(1857). A dove symbolizes the Holy Spirit. Elizabeth Siddal appears in Rossetti’s painting ‘Mary Nazarene’ (1857) A holy dove hovers nearby. In 1862, Lizzie died of an overdose of laudanum. Her memory continued to haunt Rossetti for years and eventually he was plagued by health and mental problems. A chaffinch landed on his hand while visiting poet William Bell Scott. Scott was apparently perplexed when Rossetti shared his belief that Lizzie’s spirit had migrated into the bird. 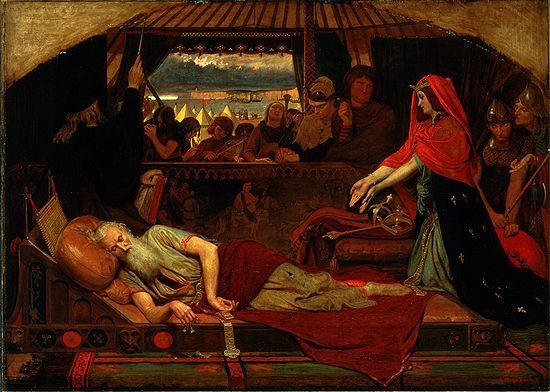 Did Rossetti really believe that souls migrate into birds after death? Or was this a new notion, brought on by the stress of his ill health? At the time of this visit to Scott, Charles Augustus Howell (known as the worst man in London) was determining what steps were necessary to have Lizzie’s body exhumed in order to retrieve Rossetti’s poems. Perhaps viewing the bird as Lizzie allowed him to see her disinterment as not disturbing her in any way, as her soul was now flying free in the chaffinch. 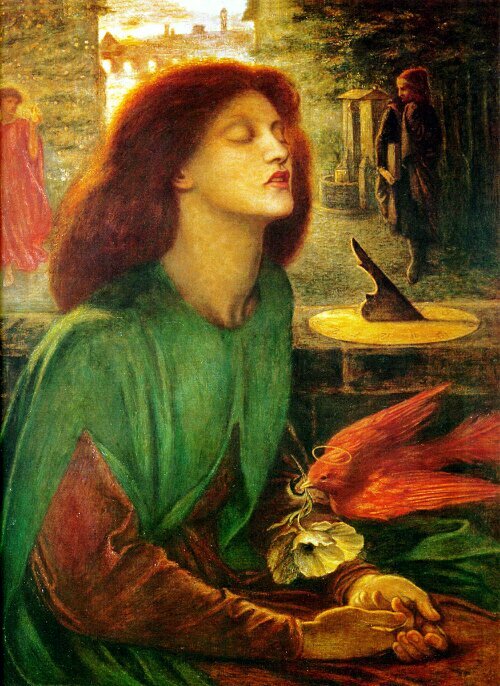 ‘Beata Beatrix’, Dante Gabriel Rossetti’s tribute to his wife after her death. 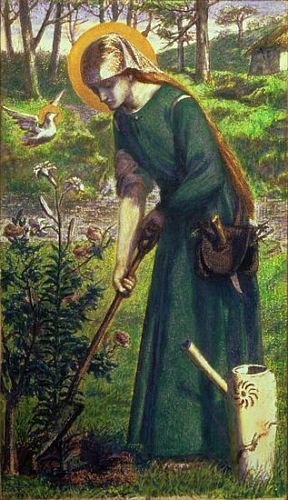 Rossetti memorialized her in his painting Beata Beatrix, a tribute to Lizzie that incorporates a poppy flower being delivered to her hands by a dove. Opium is derived from poppies; the dove delivers to her the very source of the ingredient that killed her. 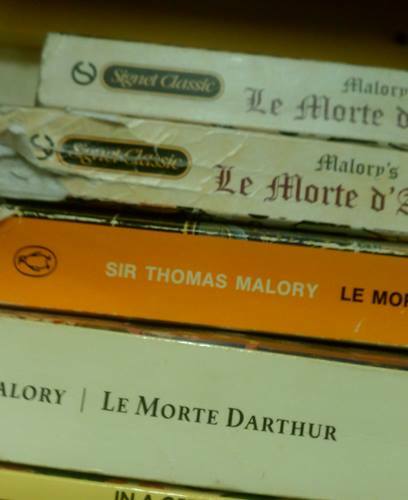 There is more than one version of the work. A dove appears in each, usually red but it is white in one depiction. Although there are noticeable changes from work to work, the composition of Beata Beatrix remains the same. Elizabeth Siddal appears as Beatrice, Dante Alighieri’s love and guide in La Vita Nuova. In the background we see the figure of Alighieri and the allegorical figure of Love. And then there’s that dove, a bird that usually symbolizes peace and holiness, yet in this work it also the messenger of death. 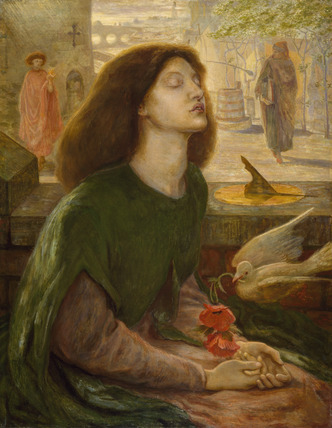 Perhaps Rossetti envisioned the dove delivering peace to Siddal, the peace she found in laudanum and the peace she would hopefully find in the afterlife. 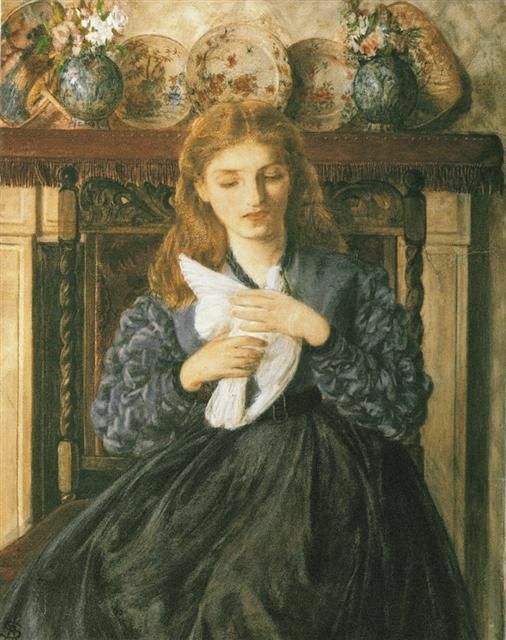 Rossetti associated Lizzie with doves in a way that was sweet and romantic during their relationship and became incredibly sad and morbid in Beata Beatrix. Instead of ending on such a sad note, I’d like to share his Valentine poem to Lizzie, his “dear dove divine.” Written in 1855, it is a delightful and somewhat humorous poem and I can feel the love behind it as I read it.